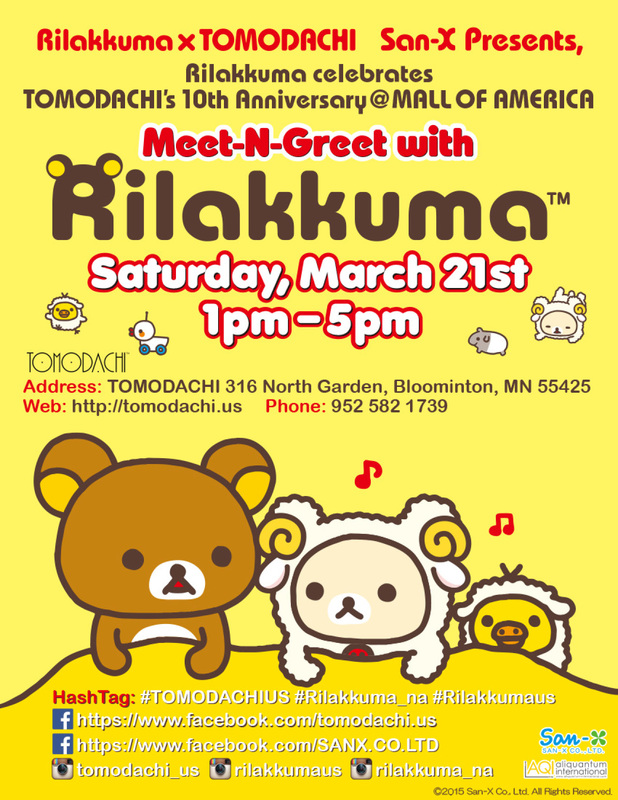 San-X will be hosting a meet-n-greet event with Rilakkuma at TOMODACHI’s Mall of America location! As part of our 10th anniversary celebration, the event will take place on Satuday, March 21st, from 1PM to 5PM, and visitors can meet Rilakkuma in person, along with donating a variety of Rilakkuma buttons and prizes for our raffles. We will also be hosting a San-X gift bag giveaway, which will feature a variety of Rilakkuma-themed items, including pillows, headphones, finger puppets, stationery, mugs, and more! Three of these bags will be given away to lucky winners who stop by our 10th anniversary event and take a photo with Rilakkuma. Simply post your photo with Rilakkuma to Instagram, tagged with #TOMODACHIUS, #rilakkumaus, or #Rilakkuma_na, for a chance to win one of these adorable Rilakkuma bags! Winners will be announced on March 21st after the event through Instagram. To find out more about Rilakkuma’s visit to TOMODACHI, as well as other events at our 10th anniversary party, click here!